This past event has already happened. Please take a look at our Upcoming Events Page to see future events. 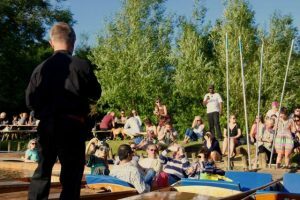 We’re delighted to be able to host the renowned Opera Anywhere for a unique performance of opera on punts. After an opening show at the Boathouse, they will punt & sing their way upstream to the Victoria Arms, arriving around 6:00pm for some refreshments and more Opera before making their merry way back to the Boathouse. Everyone welcome to come along and enjoy the spectacle. You can relax with a Pimm’s at the Boathouse or take a punt (no booking needed) and follow the opera along the river. CB couscous & chicken kebabs or feta, strawberries & cream. In the event of extreme weather this may be postponed or cancelled. Any bookings can be carried forward or refunded. We look forward to seeing you on Sunday 18th June!! !